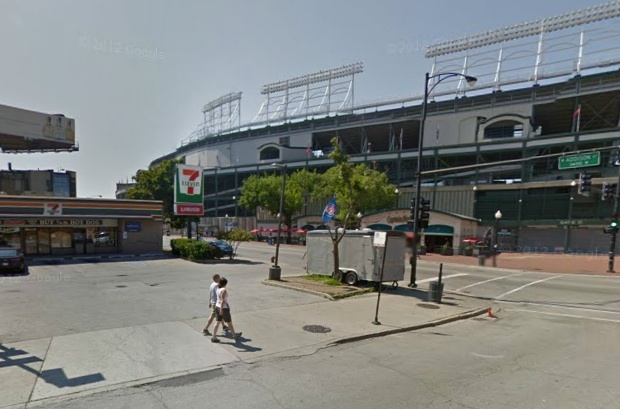 REPORT: A 25-year-old South Side man was shot on the sidewalk across from Wrigley Field this morning by a gunman with a tattoo on his face and a White Sox hat on his head. The victim, who sought help at a nearby 7-Eleven, said his assailant—a black male, 23 to 25 years old, 5'8" tall, wearing a blue sweatshirt—pulled the trigger and then "casually walked to the Addison L stop." RESOLUTION: Arriving officers saw a southbound CTA Red Line train leaving Addison station and ordered it to be stopped and searched for the gunman. 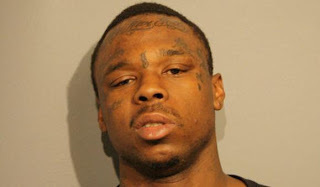 The train was stopped by 18th district officers at North/Clybourn, but no one matching the perpetrator's description was found. Fire department ambulance #6 took the victim to Illinois Masonic Hospital with a gunshot wound "right in the middle" of his lower back, according to police. Police believe the victim knows the gunman and detectives have developed information that differs significantly from the victim's version of events. Oh, and if you happen to be the victim and you'd like to get your "property" back, please inquire at the 19th district police station. I'm sure the officers would be thrilled to see you again. 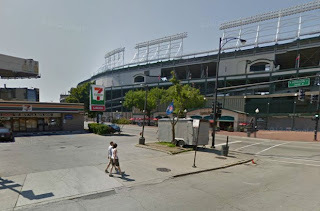 UPDATE 22 APRIL 2013: Crime in Wrigleyville and Boystown has learned that, in addition to knowing the gunman as reported above, the victim may have been conspiring with the gunman to commit a robbery in the area. Police sources indicate that the victim and the gunman got into a disagreement over the proposed robbery, leading to the victim being shot. Patrol officers in the city's 20th District picked up a suspect who is now being questioned. UPDATE 23 APRIL 2013: DNAInfo.com is reporting an arrest in the case. UPDATE 23 APRIL 2013: A convicted robber has been charged and is held on $900,000 bail. Full details are available at the Chicago Tribune. Marcus E. Harris, heading to prison. Again.